In the year 2000, a small city in Israel, Sderot, was the target of missiles from terrorist attacks and many of the children living in these conditions developed serious emotional disorders contributing to lowered educational standards and depriving the children of a carefree childhood. In response to this, the Russian Jewish Community Foundation in Boston came together and began a project that would take the children out of Sderot for 10 days in the summer to afford them a vacation. Thanks to the outstanding efforts of the community, the Boston-Sderot Project has been successfully running a summer camp and a year-round community center for the past 8 years. Counselors from the Russian/American Boston community travel to the camp as counselors, to simply show these children unconditional support. 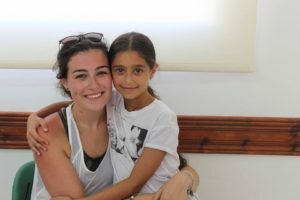 The Boston-Sderot project not only gives these children a chance to enjoy themselves, but also affords a bridge across the generations between the counselors and the children. I have been involved in the Boston-Sderot project since 2012, and have traveled to Israel both as a counselor (2012), and then as the Program Director (2013/2015). Having been born in Israel and moving to Boston at the age of 3, this strong connection to the land of my birth, has brought me back to the camp year after year. This year I was able to apply newly gained knowledge from all of my clinical experiences as a graduate clinician in Speech-Language Pathology at Northeastern University. I implemented several new activities and worked on creating a Math/English curriculum to be shared with the Boston counselors to use during future camps. 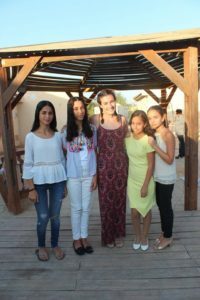 Using my knowledge of education, literacy, and specific learning styles, I worked to establish an effective way to teach these children new Math and English skills while keeping it fun!